Tamworth's Hall of Memory was opened by the future King George VI on 29th May 1924. It contains two large tablets with the names of the 608 people of the area who died in the First World War. On 12th November 2006 I went and took the following two photographs of the names of the four family members who died. On 27th May 1923 a War Memorial was dedicated within St. Editha's Parish Church in Tamworth. The Tamworth Herald of 2nd June 1923 gives a very detailed report of the dedication service. Twenty tablets of red Hollington stone contain the names of 265 people of the locality who died in the War. The stones were prepared and erected by H Charles Mitchell of Tamworth. 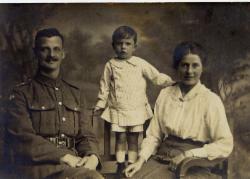 Here Percival is with his wife Phyllis (née Spooner) and their son Norman. 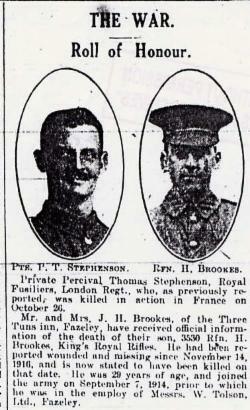 It looks like the obituary in the Tamworth Herald in December 1917 used a cropped image of this photo. This is how the Herald announced to it's readers that another local man had died overseas. I wonder if many people at the time went straight to the Roll of Honour column, just as some might go straight to the crossword, letters or sports pages today? How did his widow, mother and the rest of the family feel reading it? When did his brothers who were on the Front Line get to hear the awful news? Phyllis was pregnant when Percival died. The following May, Mary Stella Stephenson was born. I haven't discovered what happened to her yet. If she was still alive, she would be almost 90. Norman, their son, died in 1981 in Solihull. When I started investigating Percival's death, I met an anomaly. He hadn't officially died! 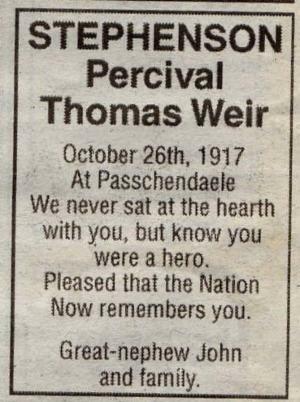 Whilst his name appeared on local war memorials and in the Herald, I couldn't find a death certificate and he wasn't mentioned in the Commonwealth War Grave Commission database or the 21 volume Soldiers who died in the Great War. In October 2005 the General Register Office issued him with a death certificate and in 2007, his name was added to the Tyne Cot Memorial. You can read about what happened in more detail in Issue 34 (February 06) of Your Family Tree magazine as a .pdf file here. 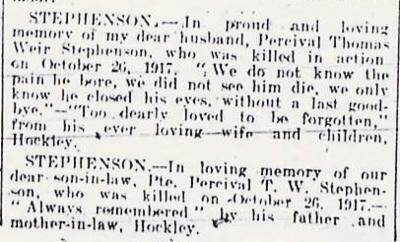 The following four scans are taken from the Herald on the anniversary of Percival's death. These powerful words show the depth of feeling that his death evoked within the family. It is interesting that only Phyllis' family put their thoughts into print though. With Phyllis remarrying in 1922, 1921 was the last year that their sentiments were quoted. Unfortunately I don't possess a photo of Charles in uniform. 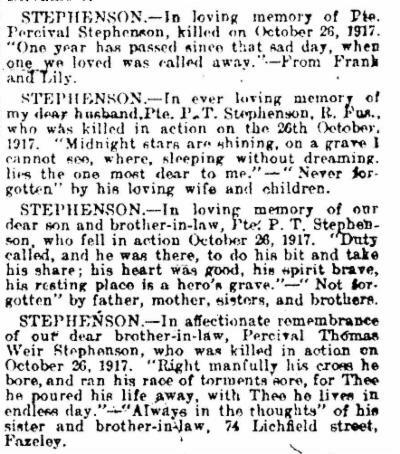 Out of all the Stephenson brothers, his was the only Army Service Record that survived the bombing of the 2nd World War though. This is a postcard of George - he is on the front row in the middle. 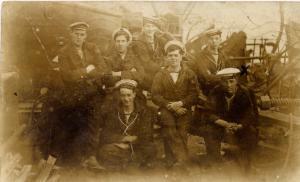 The chap on his left sent the postcard after the Rohilla sank on 30th October 1914. 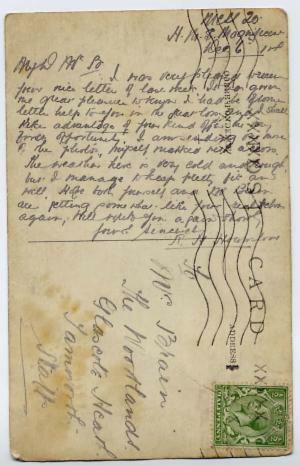 You can read the message on the reverse below. I have a large framed colour drawing hanging up of George, which is based on this postcard. It was made in 1919. 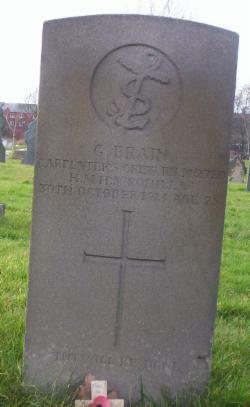 In December 2006 I downloaded his naval service record from The National Archives. During the First World War, approximately one in five British soldiers were killed and three in five were wounded. It touched all of society. How did the survivors feel on returning home I wonder? 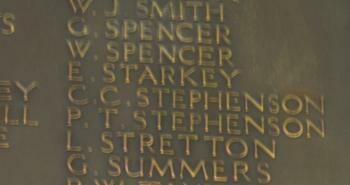 Harry Stephenson was a Sapper in the Royal Engineers. Unfortunately, looking through the Medal Index Cards at the National Archives in London, there were four Harry Stephensons who served in the Royal Engineers during the First World War. 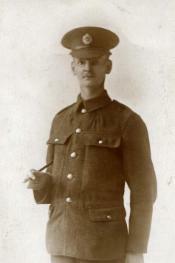 This photo is dated 15th July 1915. I have the ribbons to his medals, but somehow the metal parts disappeared years ago. He died in 1968. 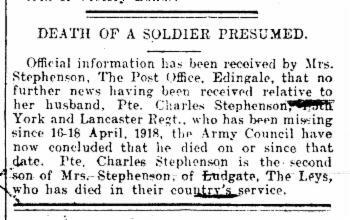 Edgar Stephenson was a Regimental Quarter Master Serjeant in the South Staffordshire Regiment. 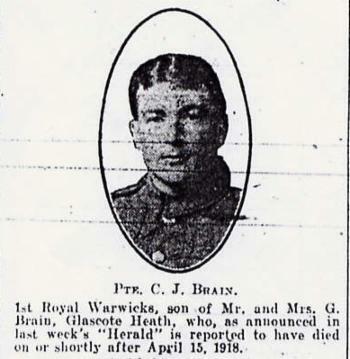 He was awarded the Military Medal in 1917. He died in 1984. 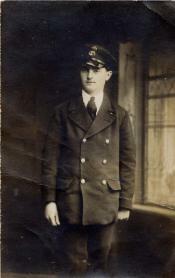 John Brain served in the Royal Navy for 27 years. He eventually became Chief Engine Room Artificer. 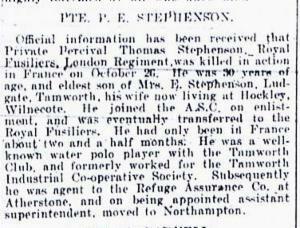 In civvy street, he worked for Thompson and Southwick's - an engineering company in Tamworth. He died in 1982. He was one of my godparents. 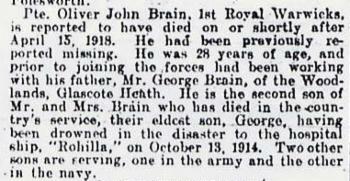 Reginald Brain, like his father George, was an explosives expert for the mining industry. 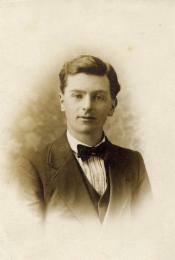 With many collieries in the Tamworth/North Warwickshire area, he was in high demand for his skills. This was where he fought in the First World War. He died in 1977. A year before he died, he gave my family his piano. I played it regularly for the next ten years and worked hard at becoming a good pianist. 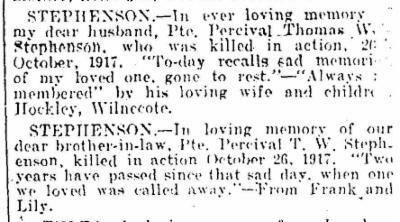 John Dey Stephenson (1899-1976), a more distant relative, was a 2nd Lieutenant in the Royal Field Artillery. 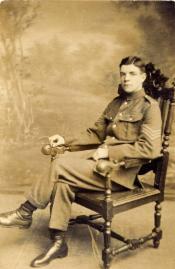 (His grandfather John had been in the Royal Artillery for many years in the mid 19th Century. 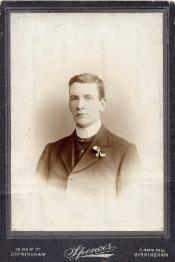 This John was an older brother to my gggrandmother Elizabeth.) Here is a .pdf file of John's Medal Index Card.